Faculty Workshops: DELTA regularly offers workshops on WolfWare technologies, including Moodle, Mediasite and Collaborate, in addition to other teaching with technology topics. To see the full schedule and register for sessions, check the workshops page. WolfWare Classic End of Service: We are retiring WolfWare Classic, our homegrown learning management system May 14th, 2018. We are currently working on tools and services to provide faculty with similar functionality. Please visit the WolfWare Classic Transition page for support options to assist with the transition to Moodle and other technologies. Check out our workshops! They’re the best way to get up to speed. New WolfWare Tools: We released two new tools Fall 2017 as part of the WolfWare enterprise suite. Based on feedback we received from faculty and staff across campus we have made improvements and continue to refine the interface and functionality. Please consider activating and using these tools when you create your WolfWare space. The WolfWare Email tool allows you to email your class or just a single section with a set of convenient email addresses. This tool functions in much the same way as the email lists that are available via WolfWare Classic. The WolfWare WordPress tool allows you to create a public site that can be linked to your course. Both tools are currently released in a Technology Preview mode. They are working versions that will allow us to solicit your feedback about the functionality and design of the tools. Please take a minute and use the feedback link to let us know how they work and whether there are improvements you would like to see. Video and Web Conferencing: DELTA provides two tools to easily make video conferencing and recorded content available for your class. Take a look at Blackboard Collaborate for live classes, office hours and other synchronous communication needs. My Mediasite is great for recording content, demonstrations and recording lectures in advance. LMS Maintenance Windows: We reserve blocks of time to take WolfWare components offline for upgrades and maintenance. View the maintenance schedule to stay up-to-date with WolfWare availability. We will also post a notification reminder about maintenance windows on WolfWare approximately one week before it happens. Feature Requests and General Feedback: We welcome your input to make our WolfWare technologies as useful as possible to your teaching. 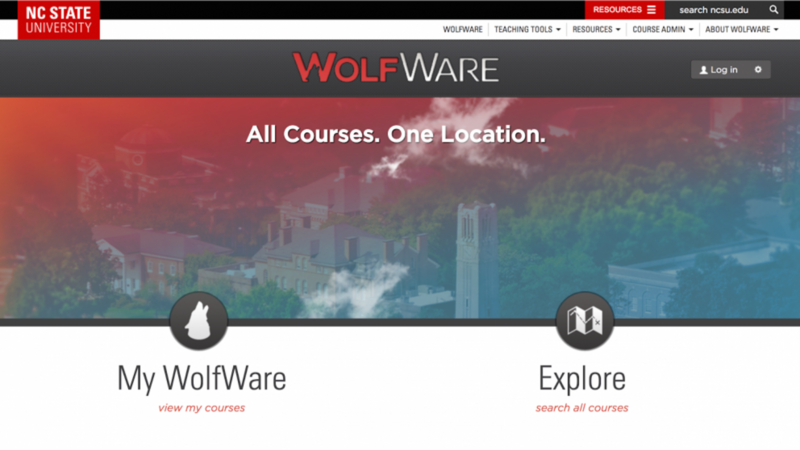 To provide feedback and to submit (or view) feature requests, go to wolfware.ncsu.edu and select “Send Feedback” at the bottom of the page. Contact DELTA’s LearnTech help desk at 919.513.7094, or email learntech@ncsu.edu if you need assistance.